Somewheres around June in this year of craftiness, fellow gangstas, my friends The Motion Sick were on the Neutral Uke Hotel tour –pretty gangsta of them to be playin madd Neutral Milk Hotel jams on the Ukelele (so check that out) — and they run into madd crafty person, Shannon McCarthy, aka Comfortably Lovely, aka creator of A Craft Thing, this totally indie Craft Festival near the Crafty city of Detroit MI. 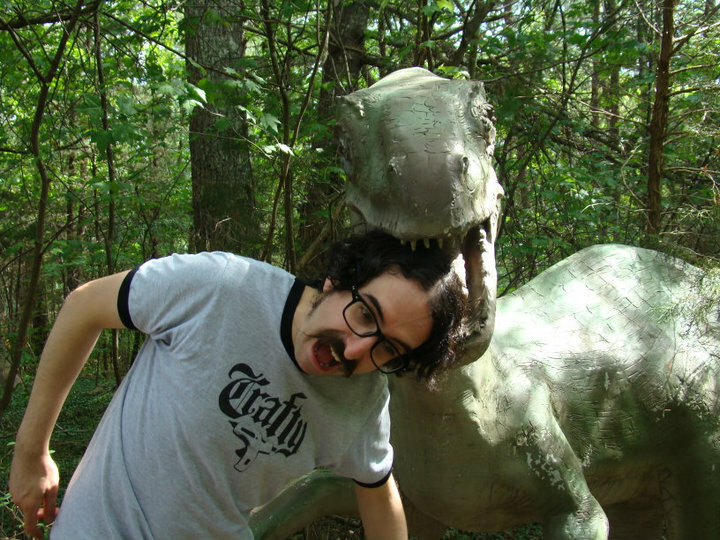 Micheal J. Epstien of course is wearing his crazy comfortable (and flexible) Crafty T-shirt and before long they are surfin’ on the interweb to find the dopest gangsta arts and crafts video in the whole wide web, yo — Crafty the Video, aka Digital Short: Craftygangsta.com. So, Shannon McCrafty askes me, J-Krafty, if Craftygangsta.com will be a official sponsorizor of A Craft Thing, yo. Of course I was all like, yo, J-Krafty is a lone wolf. I craft by my own rules and mostly in my basement where other haters don’t be seein all my madd crafty ideas. But it turns out all they wanted was fo’ me to donate some T-shirts to they raffle y’alls. After thinking on that for a long while, like five minutes, I decide to sponsor the crap out of it. Plus they wants to be using my video to announce that A Craft Thing is gonna be all up in this Detroit, come December gansta. 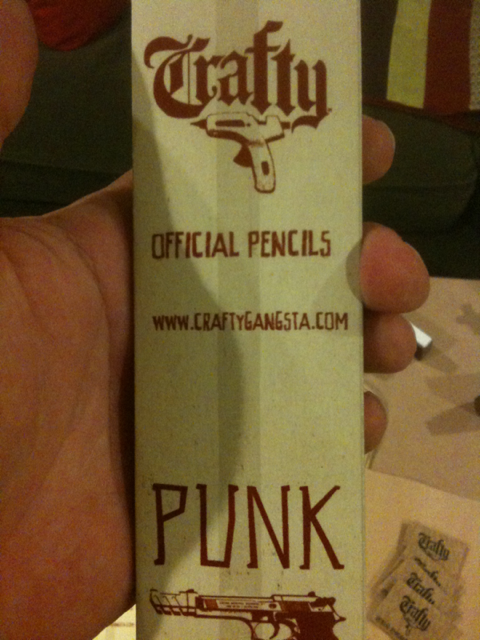 Boom, just like that, CraftGansta.com is an official sponsor of A Craft Thing. But nows I got to up the game, homies. 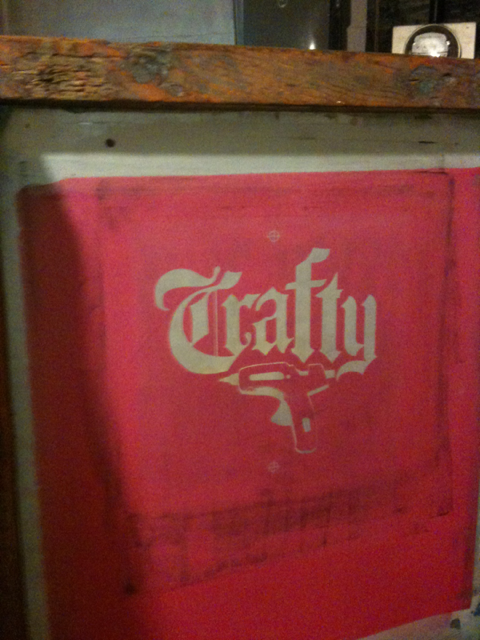 J-krafty don’t just send out t-shirts and call it a day, yo. I gots to be doin some craftin’ up in here, so I head to the basement, my magical craft den/laundry room. First up, I make up some xs crafty t-shirts which ain’t even available to my normal craftas so you know that junk is special and such. 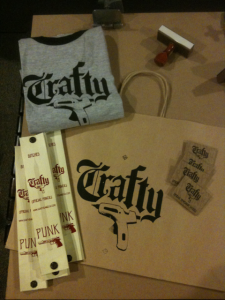 Then I start silk screenin’ on some kraft paper shopping bags and then rubber stamp all over that! 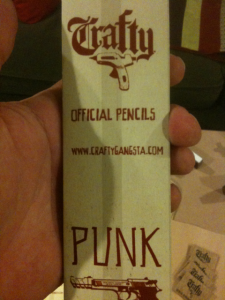 I get some craftygangsta.com pencils and make up pencil packs, then some crafty temporary tattoo packs and a finish that junk up with a home-burned CD-R of Crafty and Crafty Acoustic. I’m totally in the sponsor zone now haters.